According to the China Association of Automobile Manufacturers, in the first eight months of 2015 118,020 new energy vehicles were produced in China, a 2.6-fold increase related to the same period in 2014. Sales rose 2.7-fold to 108,654 units. NEVs refers to battery-electric (BEV), plug-in hybrid electric (PHEV), and hydrogen fuel cell vehicles. But no one is producing hydrogen fuel cell vehicles in China right now. The breakdown of the January through August NEV production, according to CAAM, was 74,727 BEVs produced and 68,316 sold. For PHEVs, 43,293 were produced and 40,338 sold. Those numbers are a big jump over the previous year, to be sure. They are a tiny percentage of all vehicles sold in China, and a far cry from the 500,000 unit goal China’s central government has set for 2015. But things are moving in the right direction. Aren’t they? Well, that depends on whether or not the goal is to have Chinese automakers produce EVs or to have Chinese consumers actually buy EVs (I will use EV to refer to both BEV and PHEV) There are powerful incentives for domestic automakers to produce EVs. And producing EVs that no one buys doesn’t look good, so there is also powerful incentive to report EV sales, regardless whether or not they reflect consumer demand. It has been reported over and over that China’s central government, and some municipal governments as well, offer incentives to consumers to purchase EVs. What has been less well-documented is that China’s domestic automakers receive government subsidies to cover EV R&D and production costs, as well as the high cost of the battery. Those subsidies can boost an automaker’s bottom line, an important task at a time when passenger car sales in China have slowed to a crawl. A friend of mine who is a top executive at a multinational supplier with substantial operations in China first alerted me to this phenomenon. A day later, he received a Bernstein report putting numbers to his assertion, and forwarded that report to me. 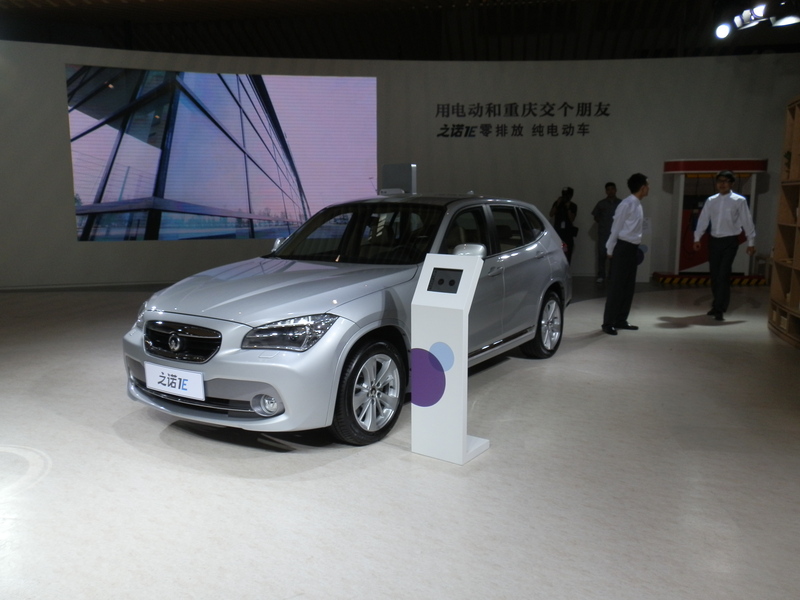 According to the Bernstein report, domestic automaker BAIC booked RMB652 million in government subsidies for sale of EVs in the first half of 2015, allowing it to report a net income of RMB2.17 billion in that period, “in-line with our recently lowered (and below consensus) expectations,” said analyst Robin Zhu in the report. I emailed Zhu and he said this was the first time he had actually seen an automaker quantify the subsidy so clearly. Is the Zinoro 1E boosting Brilliance’s bottom line? I will be in Beijing Oct 20-26. I will be moderating at an EV innovation summit on the 23rd tied to the Formula E race being held in Beijing on Oct 24. Will be interesting to note how many EVs I see toodling around the streets in Chaoyang and Dongzhimen, where I’ll be staying. And how many charging stations I can locate. I will report back. Meanwhile, hope to see some of you at the EV summit! ← Are niche EV markets in China where the real opportunity lies? UQM hopes so. Thanks as always for the content-rich post. I can say anecdotally from Shanghai that PHEVs are getting very common on the street – BYD’s Qin in particular is everywhere, but I’ve also ridden in a couple of others via Uber. I personally think the question is not whether people are buying them – the subsidy plus relief from Shanghai’s incredibly high license fee is ensuring they are. The question is whether they are plugging them in, and I’ve heard mixed things. I agree with your suspicions that charging stations are still very few, but of course a PHEV with a home charger should rarely need one anyway. Beijing doesn’t have the license fee so I can’t say what you will find there. Yes, BYD has sold a goodly number of Qin models, mainly in a few cities. But they are PHEVs and don’t account for the BEV sales, which even bigger than PHEV sales. Good point. I’ve seen a few PEV’s but definitely not many.